Typical signs of carpal tunnel syndrome are pain, numbness and tingling in all fingers (except your smallest finger) and a weak grip. Arthritis may increase the risk of carpal tunnel syndrome. While there is no home remedy, over the counter pain relief will help address the symptoms of carpal tunnel, and splints available at many drug stores can provide relief. However, if symptoms persist, progress and remain untreated by a medical provider, they can lead to permanent nerve damage. It is important that you see a hand specialist if symptoms persist beyond several weeks. Carpal tunnel is frequently associated with those who work in occupations where the hand experiences constant vibration, repetitive wrist flexion or prolonged driving with the wrist on the steering wheel. However, there are many other contributors to the development of carpal tunnel syndrome. If you’ve experienced a trauma to your upper extremity, such as a distal radius fracture, you may be at risk. Genetics, medical conditions, aging and lifestyle choices can also increase the likelihood, such as diabetes, hypothyroidism, rheumatoid arthritis, obesity, alcoholism and smoking. Women are more likely than men to develop carpal tunnel syndrome, and pregnancy and menopause can also play roles. People with symptoms of carpal tunnel syndrome experience numbness and tingling in their thumb, index finger, middle finger and the portion of the ring finger where the radial nerve passes through. You may notice your symptoms increase when you hold a phone or drive. Symptoms are usually worse at night. You may feel a strong need to shake your hand. When you experience symptoms daily and they become bothersome, it’s time to see a doctor. You should also see a doctor if you noticed weakness in your hand that you otherwise can't explain. The diagnostic process for carpal tunnel syndrome begins with a thorough history and physical exam and possibly an X-ray of the hand or wrist. Your provider may order a nerve conduction study and an electromyogram (EMG) to check for other nerve problems. If you have mild or moderate symptoms of carpal tunnel syndrome, you may gain benefit from a few simple exercises, however, research indicates that you’ll get the best results by combining these exercises with prescribed treatments and activity modification that lessens the strain on your hand and wrist. If carpal tunnel release surgery is right for you, it will be done as an outpatient procedure. The doctor will cut the ligament that crosses over the carpal tunnel to lessen pressure on the median nerve. Current long-term studies report generally positive results for carpal tunnel release, with a clinical success rate between 90 and 95 percent. Surgery may not ease all your symptoms, as every patient heals differently and the severity of the condition varies. While you will be able to work and drive right after surgery, it may take three to four months to gain strength and normal use of the hand after surgery. You should always allow your body time to rest after surgery and avoid heavy activity as much as possible. Some patients with severe compression can take up to one year to recover. Why choose Ohio State for treatment of carpal tunnel syndrome? When treating your carpal tunnel syndrome, our goal is to try other solutions before considering surgery. If your carpal tunnel is severe and we feel surgery is the best option, the Ohio State Hand Center provides a number of different techniques, performed with expert care by hand surgeons who have extensive training. We offer either wide-awake local anesthesia or sedation during your procedure. It is your choice what technique and what anesthesia is best for you. 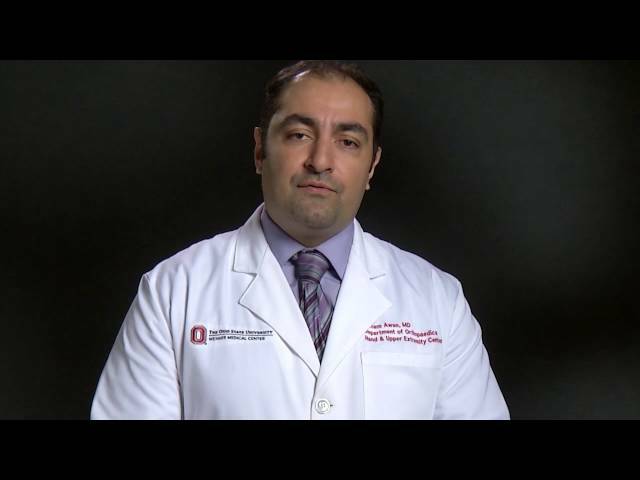 Hisham Awan, MD, explains contributing causes of carpal tunnel syndrome and how Ohio State can help patients get back quickly to activity.